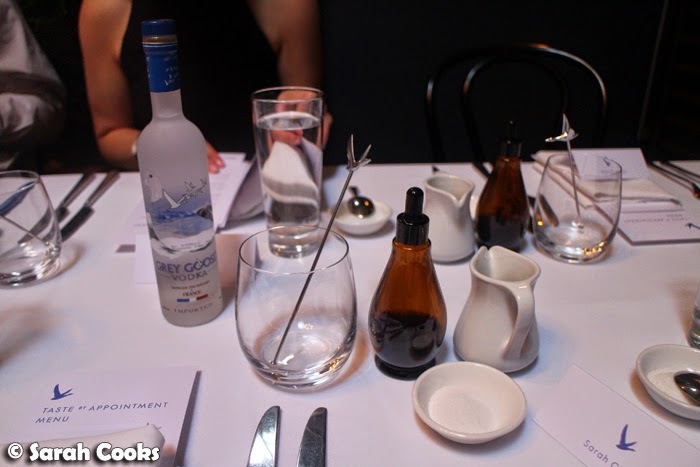 I was absolutely thrilled when I received an invitation to Taste by Appointment by Grey Goose in February - I remember reading about Winston's experience at the last round of Taste by Appointment events in October last year, and thinking it looked fantastic! 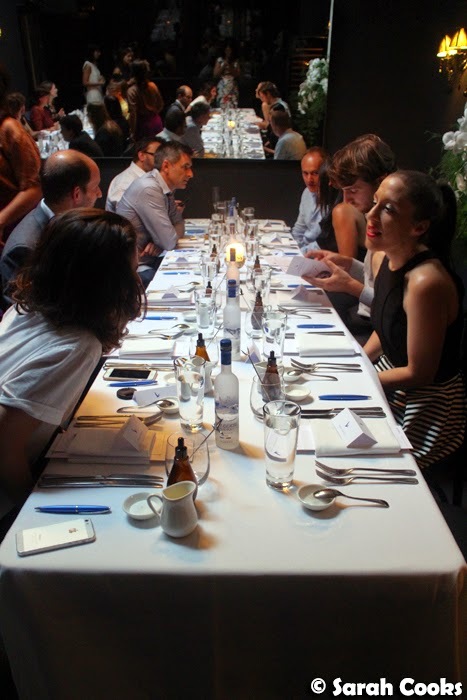 Hosted by Grey Goose vodka and brand ambassador Andy Wren, the idea behind Taste by Appointment is for guests to explore their palates through a series of matched cocktails and dishes, each with specific flavour profiles, giving us the ability to articulate what we like to drink. Life skillz, yo. The event was hosted at Saint Crispin, a restaurant I had wanted to visit for the longest time. If the prospect of Grey Goose cocktails wasn't enough, then the offer of a three course dinner at Saint Crispin totally sealed the deal. Delicious! And educational! And cocktails! Woohoo! 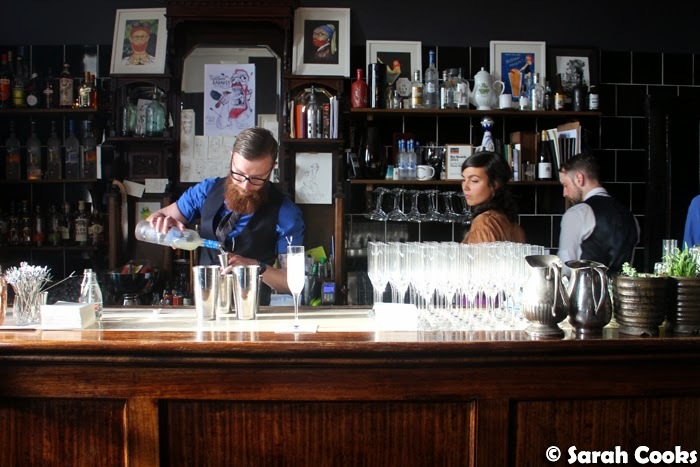 So, the evening started with drinks in Saint Crispin's upstairs bar, Thomas Olive. 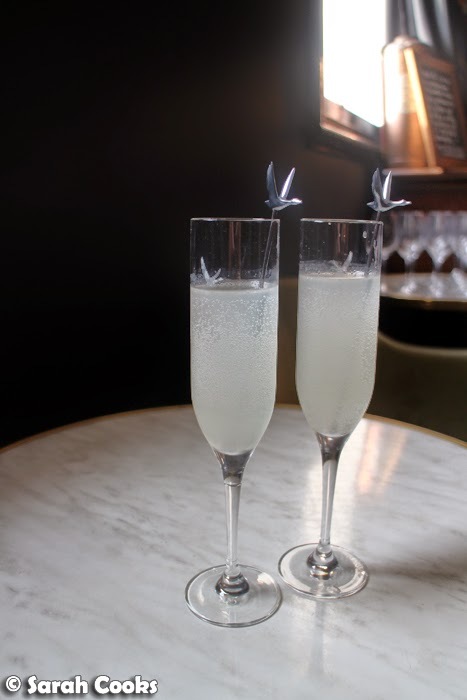 I love fruity and light cocktails, especially those with a dash of fizz in them (think: Aperol spritzes, bellinis, Champagne cocktails and so on), so I loved the Grey Goose "Le Fizz", which combined Grey Goose vodka with St Germain elderflower liqueur, fresh lime juice and soda water. From here, it was time to take our seats and begin the sensory tasting experience. Paired with Grey Goose "Le Fizz"
The first course was made up of three tomato-based amuse bouches, each with a dominant flavour: sweet, sour or bitter. Our favourite of the three amuses would give us a clue as to which flavour we'd prefer in cocktails. 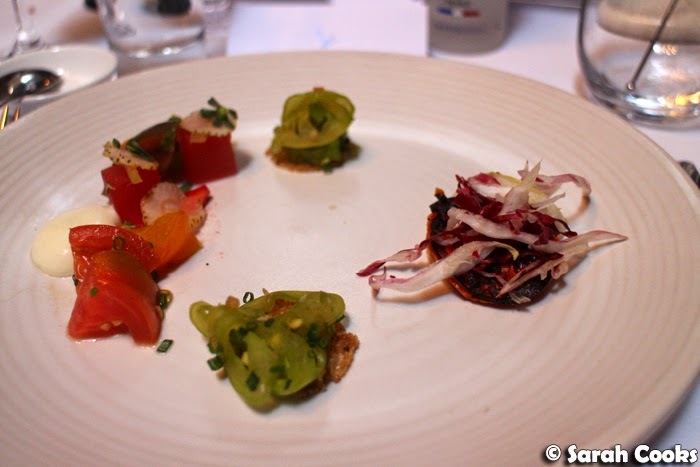 All of the amuse bouches were delicious, but I particularly liked the bitter tomato tart with shaved radicchio and endive. My preference for bitter flavours wasn't a huge surprise to me, given my personality (hah!) and my obsession with Campari and Aperol. Having identified our flavour preference, we were then instructed to make our own custom cocktail, using a base of vodka, and adding our choice of soda, bitters, sugar syrup, salt, pepper, lemon rind, and mint to taste. Pro tip: smacking mint leaves between your hands really releases their flavour and aroma. I mixed a bit of everything into my cocktail - vodka, ice, soda, sugar, lemon juice, lots of bitters, lemon zest, mint and pepper, why not? Pepper was an unexpectedly winning addition to my cocktail! With all the hard work out of the way, we could move onto the main course. (Phew! That was some serious thinking*). 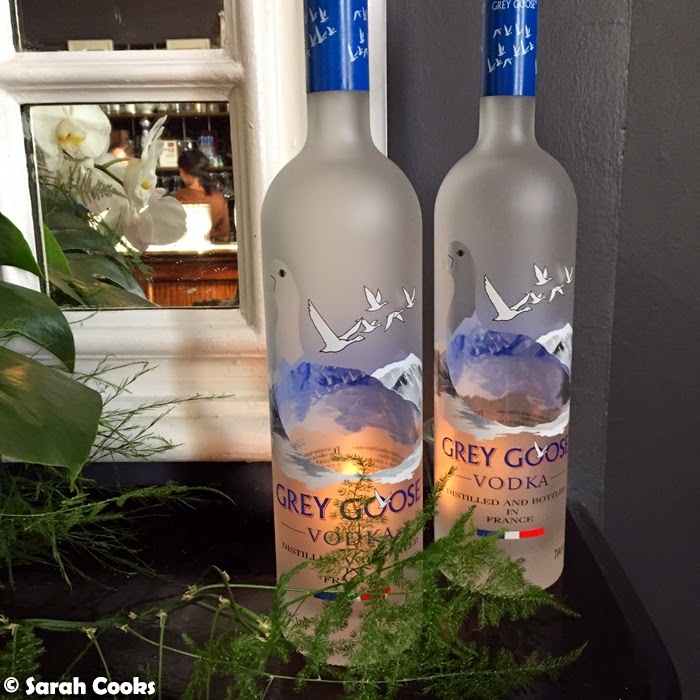 Paired with Grey Goose "Umami Poulet"
The beef dish was fantastic. 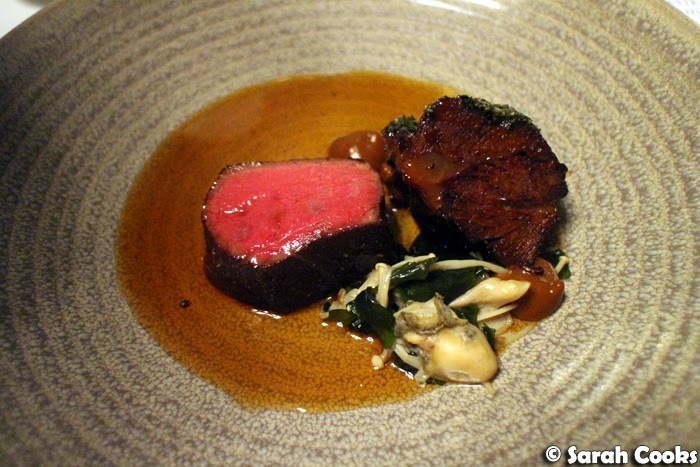 The fillet was cooked to a perfect pink, and the incredibly tender cheek had a deeply umami crust of sesame seeds and (I believe) dried seaweed. It also included a mixture of mushrooms, wakame seaweed and a Pacific oyster, and all the elements were brought together with a really rich soy and roasted onion consommé. It was such a great, well balanced dish! 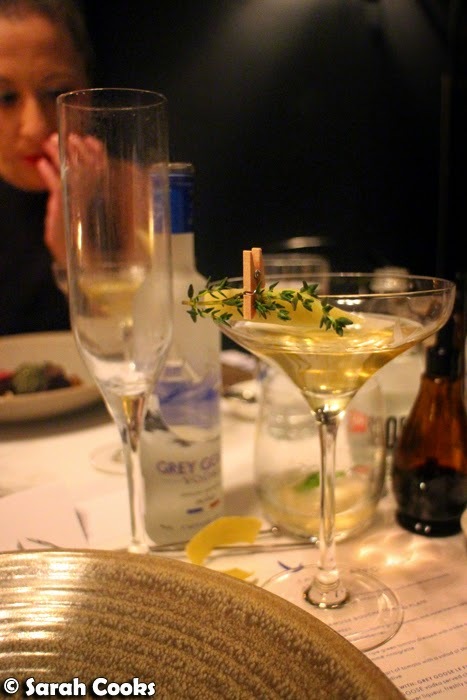 The main course was paired with a Grey Goose "Umami Poulet" - a really unusual but very appealing cocktail based on chicken fat-washed vodka. The drink had a wonderful mouth-filling fattiness and was really savoury. It literally tasted like a roast chicken dinner in a glass! Sorry, I just have to sneak in another photo of that beef dish, because it was just so good! Check out that melty tender beef cheek! 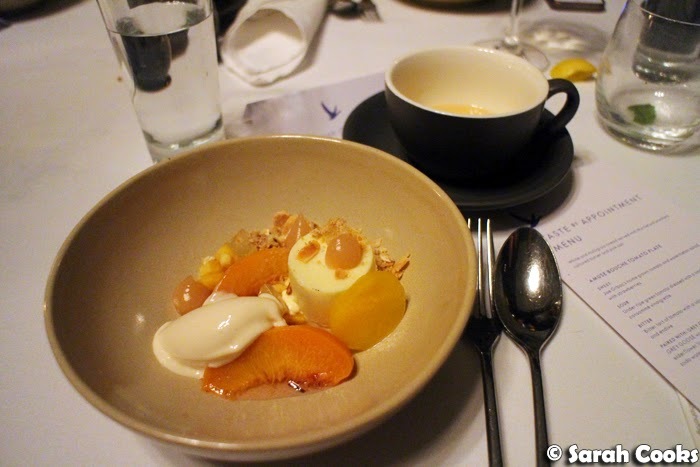 The dessert was also very impressive: a mixture of stone fruits, with vanilla panna cotta and a crisp oat and almond crumble, served with a warm peach tea. 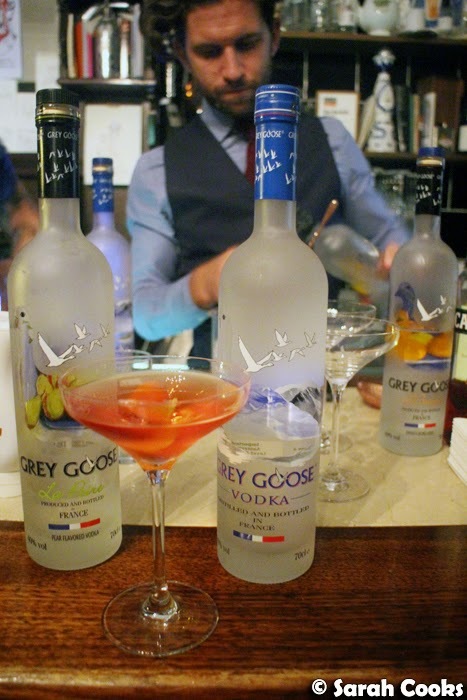 It was almost like breakfast... except that it was also served with a glass of Grey Goose La Poire, a pear-infused vodka that had a strongly alcoholic aroma, but finished with a smooth, crisp and fruity taste. 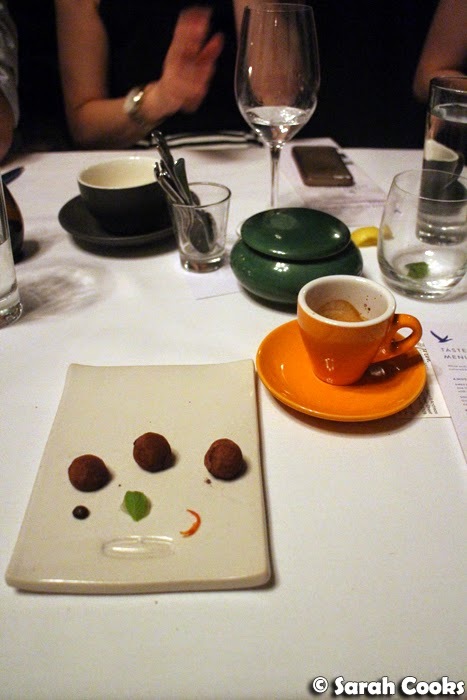 To finish off the meal, we were served some espressi and some "trigeminal" chocolates. These little truffles were infused with flavours of coffee, mint, and chilli, and were designed to tingle our trigeminal nerve, which is the nerve that controls how we bite and chew, and is responsible for feelings in the face. 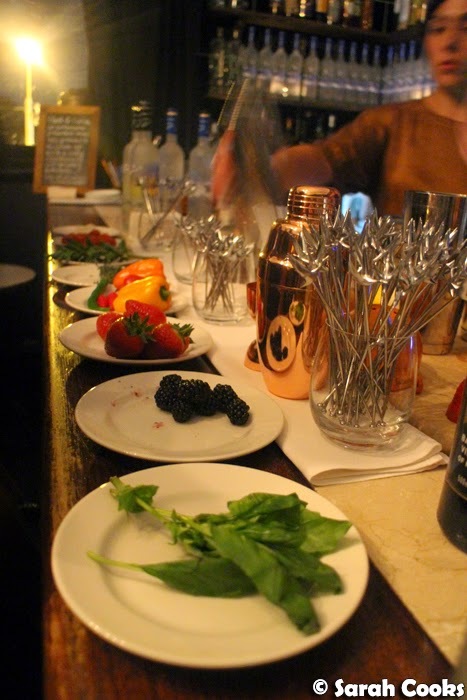 Then it was back to the bar, where we could test our newfound knowledge of our palettes by ordering custom cocktails. "Something bitter please". 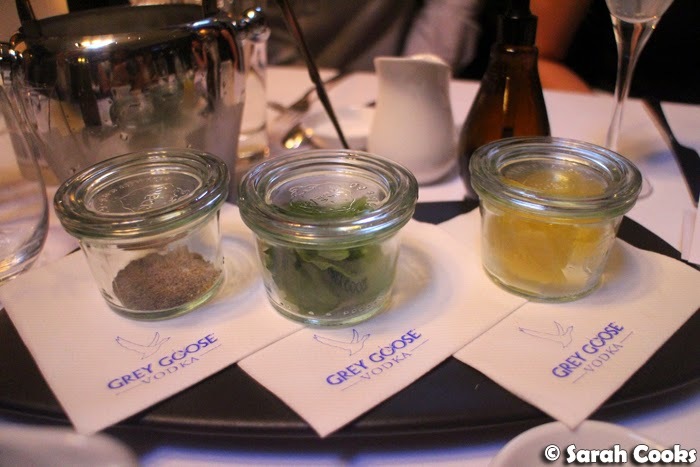 If you get an opportunity to attend one of the Grey Goose "Taste by Appointment" events, I would highly recommend it. The whole evening was fun, informative, and full of excellent food and cocktails. 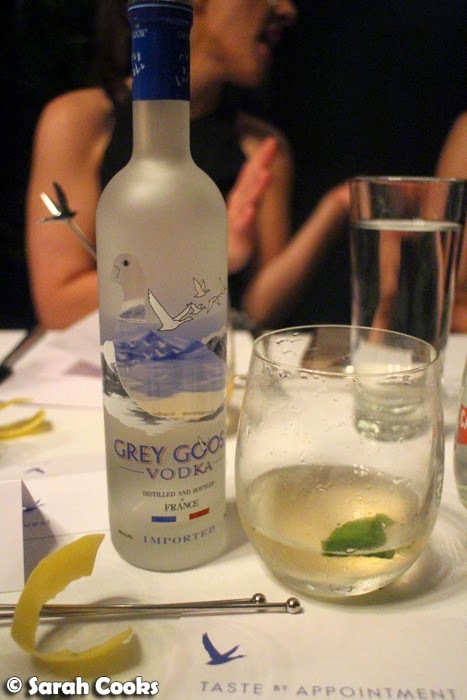 Big thanks to Grey Goose, Andy Wren, Saint Crispin and f4 Consulting for a fantastic night! Sarah and Jimbo attended Taste by Appointment as guests. *If you were thinking: "I'm sure she meant to say "serious drinking"", then you'd be right. This was so interesting because I attended one of the Sydney dinners and it was great to see how they compared! 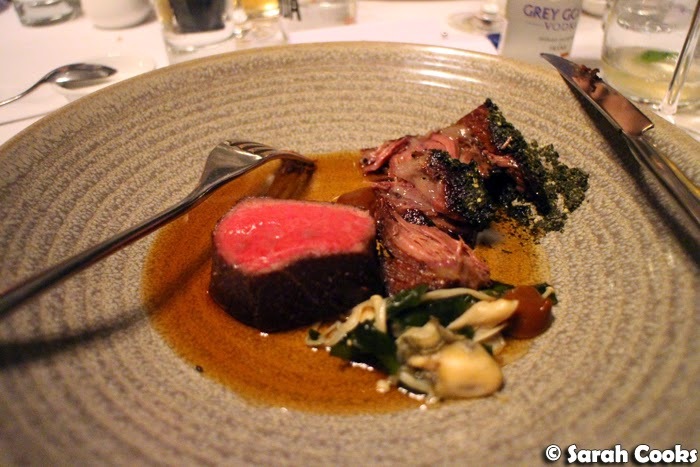 That wagyu beef fillet looks glorious! Oh gosh, I'm such a gin girl but this makes me think I should switch sides.